Small and midsize businesses are forced to undergo digital transformation to remain competitive and enable new services in today's market. 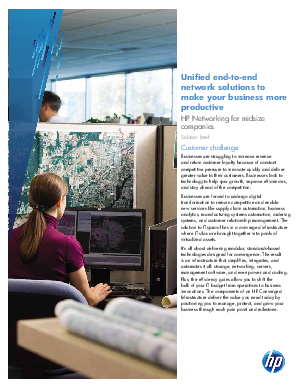 The solution to IT sprawl lies in a converged infrastructure where IT silos are brought together into pools of virtualized assets. This solution brief explains how to establish an infrastructure that simplifies, integrates, and automates it all: storage, networking, servers, management software, and even power and cooling- allowing the Small and midsize businesses to shift the bulk of the IT budget to business innovations.